National Bank of Rwanda governor John Rwangombwa. Rwanda's annual inflation is expected to increase to 5 per cent in 2018 up from 4.9 per cent registered in 2017, the National Bank of Rwanda (BNR) has said. Central Bank Governor, John Rwangombwa said inflation is expected to average at 5.0 percent in 2018 compared to 4.9 percent realized in 2017. The country's headline inflation declined to 4.9 percent in 2017 from 5.7 percent in 2016, thanks to the ease in exchange rate pressures and the significant fall in food inflation, especially during the second half of 2017. Sector experts said the inflation rate is still manageable and will not in any way destabilize the economy going forward. Besides it gives more room to the Central Bank to continue tracking some of the key macroeconomic developments in addition to the already existing accommodative monetary policy stance, said Rwangombwa. The country's annual inflation increased by 1.3 per cent in January 2018, largely due to increase in price of non-food items like housing, fuel, electricity and gas. However, the central Bank is counting on the much anticipated good performance from the agriculture sector. For-example, it was good performance of the agriculture in 2017 that boosted Rwanda's economic growth in addition to easing food prices and inflation in general. Meanwhile, some analysts like Patrick Habumugisha a Kigali based economist, are skeptical about agriculture's expected performance and increasing fuel prices in the country and the effect these two may have towards the overall general economic performance. "Besides, you still have to watch out for imported inflation especially in some key sectors like construction," Habumugisha said adding that all stake holders must keep an eye on how agriculture will respond to climate change and global fuel prices. Rwanda Utilities Regulatory Authority (RURA) last week announced for the 5th time in less than 6 months, an increase in fuel prices. 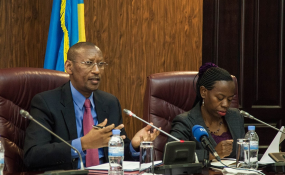 However, speaking during Central Bank's Financial Stability Committee and Monetary Policy Committee breakfast meeting in Kigali on Wednesday, governor Rwangombwa said, "Though oil prices are increasing, they are still below the 2015 levels and thus pose no serious challenges to inflation developments." The central Bank remains buoyant that an ease in exchange rate pressures and the significant fall in food prices will keep Rwanda's economy stable. In 2017, Rwanda's exports receipts increased by 57.6 percent while imports slightly declined by 0.4 percent reducing the trade deficit by 21.7 percent and this is likely to continue in 2018, according to Central Bank. Equally, formal exports are projected to increase by 15 percent while imports are expected to rise by 7 percent in 2018, and this will stabilize the exchange rate at around 4.5 percent depreciation of local currency (Rwf) against the US dollar. The International Monetary Fund last year projected Rwanda's economic growth to average at about 6.8 per cent in 2018.